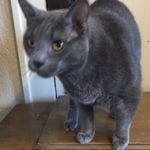 Adopt a cat from us! Grateful purrs await you! Please try an alternate method of communication (phone, text, email), or another person named, if you do not receive a response. We don’t want to miss your inquiry! You may–email the completed application to the Contact named in the post. You may also print, scan OR take phone pics and email to the Contact. Only email to the Contact named in the bio for the kitty; if not, we may not receive it! PetSmart – Bandera Pointe – 11791 Bandera Road SA, TX 78250 Adoption center only, no adoption events yet. PetSmart – Alamo Ranch – 5435 W, TX-1604 Loop SA, TX 78253 Adoption center and adoption events on most Saturdays from 11:00 am to 3:00 pm. Petco – Terrell Plaza – 1211 Austin Highway #101, San Antonio, Texas 78209. Petco – Village at Stone Oak – 23014 US-281 #107, San Antonio, TX 78258. Petco – Fiesta Trails – 12651 Vance Jackson Rd. #119, San Antonio, TX 78230. Petco – La Plaza del Norte – 125 NW Loop 410 #350, San Antonio, TX 78216. An adoption representative from the San Antonio Feral Cat Coalition is on site at the Petco-Fiesta Trails (DeZevala Rd.) and Petco-La Plaza del Norte (410/San Pedro) stores the second and fourth Saturdays of the month, 12 noon to 4 PM. Check our Facebook page for possible updates and additional adoption events. 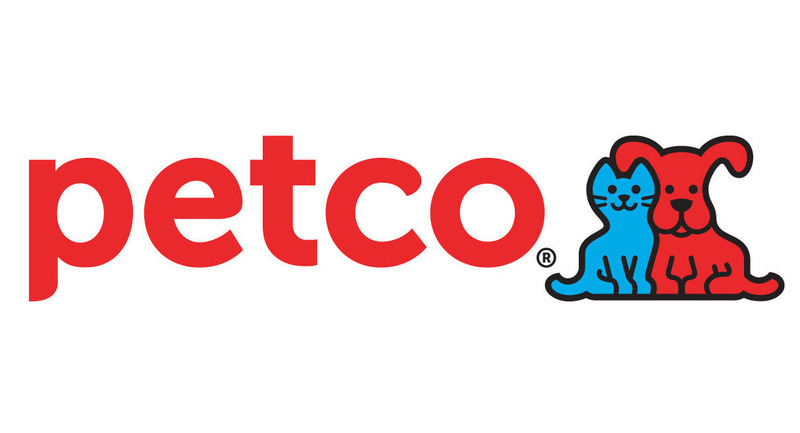 During the week, Petco staff at each of the stores will be able to refer you to an Adoption Counselor to assist you. To ensure the health and welfare of these adorable cats, all of our adoptable cats and kittens have been spayed/neutered, combo tested, received a rabies shot/ vaccinations/ dewormer/ flea treatment and are microchipped. In addition, with every cat adopted, you receive exclusive Petco coupons that will assist you in getting all the essentials for your new pet. You may–email the completed application to the Contact named in the post. You may also print, scan OR take phone pics and email to the Contact. Contact: Email his foster mom Donna. 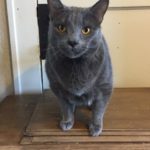 This is Bleu, a neutered male Russian blue cross. I rescued him as a kitten & he was quickly adopted by a military couple. They named him General Eisenhower. He was an “only child” with them a year & a half when the husband was suddenly redeployed to Afghanistan & the wife discovered she was pregnant with their first child. She planned to live with her in-laws during the pregnancy & they didn’t want the cat. So they returned him to me. I renamed him Bleu because he has the dark amber eyes of a French Chartreuse. 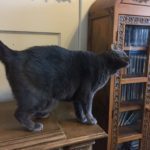 He is very big – nearly 20 lbs! Bleu is very social, a cuddler, & talkative. But he does not like sharing space with any of my other cats & fosters. He likes being an “only child” & pretty much detests his own species. I’ve tried introducing him to submissive females, kittens, laid back old cats with no success. He has been in seclusion in my study for over a year & is so lonely. He needs a forever home with no other pets. A retiree would be ideal. Below is a list of cats that we have rescued and currently have available for adoption. 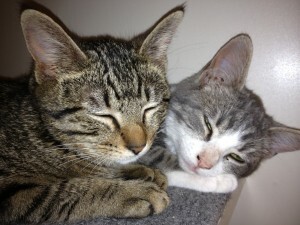 Please note: We do not ship our cats, provide any transportation, or do out of state adoptions.